Alberto Moderna Minimal Modern Christmas Tree. This must be the most perfect modern tree, simplicity at its finest! This beautiful minimalist tree features an attractive marble base which evokes quality and class. 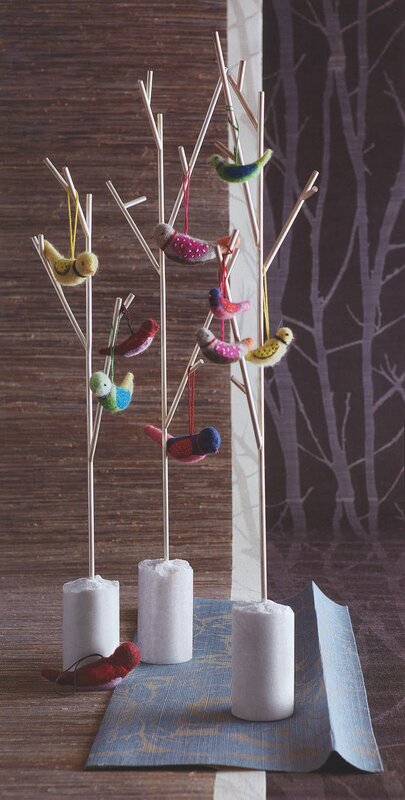 Display your favorite holiday ornaments or use these attractive felt birds (sold separately). This beautiful modern tree is fashioned with elegant silver-plated brass for a wintry glow and sit securely on heavy chiseled white marble bases. This beautiful modern Christmas tree is perfectly sized for most interiors where space comes at a premium, the perfect tree for the modern urban apartment in New York City for example. Displays beautifully on a console, shelf or table. A wonderful modern holiday decoration idea. Select from two available sizes. Felt bird ornaments are sold as an option.